I was going through Amazon Prime adding to a list I was compiling for my upcoming 2018-19 New Year Eve/Day Binge-a-thon when I came across the documentary fro filmmaker Michael Moore, Bowling for Columbine. It had been a long time since I saw the film and so I hit play. Columbine is known in our lexicon because of one of the most well known and tragic school shootings that occurred at Columbine High School in April 1999. The Columbine massacre changed the ideas and policies of schools across the country in regards to active shooters. Unfortunately, it is a problem in America that has become too common place since this tragedy. Michael Moore examines the reasons behind the massacre and tries to determine why we as Americans have so many more gun deaths than other countries of the world. He debunks the ideas of racial differences, violent movies and games by showing that other countries, specifically Canada, shares these traits but do not lash out with violence. Moore goes directly to NRA president, at the time, Charlton Heston and asks him directly about the reasons. Heston tries to drop the typical sound byte spin that he used in rallies (including one in Colorado right after the Columbine massacre) such as America has a “history of violence” and more “mixed ethnicity” but Moore immediately shot them down. You almost felt sorry for the actor because he was clearly out of his element with Moore. Heston left the interview when Moore brought up a case of a six year old boy who took a gun to school in Flint, Michigan and killed a little girl. Watching Heston slowly walk away from Moore was a powerful statement in this film. Michael Moore has a skill to approach deathly serious topics with humor and a sarcasm that is very disarming and before you know it, you are speaking to him and revealing information that you hadn’t intended to. This was in full effect here as the world was still getting to know Moore. These days, people see Michael Moore and become more on guard, seeing him more as a liberal filmmaker with an agenda. At the time, Moore was making remarkable documentaries because he was not as famous as he is now. 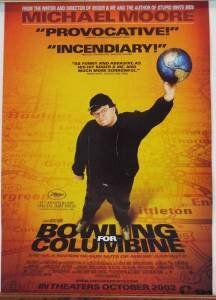 Bowling for Columbine is a powerful film with explosive content. We as a nation have never really dealt with the problem of school shootings that was highlighted by Columbine which makes this 17 year old documentary as relevant today as it was then.